Attention Cat Lovers! It's time for Weekend Cat Blogging #27! Visit Clare & her cool cat Kiri at Eat Stuff for links to this week's kitties. Want more? The Friday Ark has dozens of cats & critters. He doesnt even look cold!!!! Wish we had snow here...Wellington was very envious of the photo (although he spends most of his time inside when it's super-cold!). Finally got a new-to-me laptop - he is under strict orders to keep his distance! what a great pic. I felt like I was there. Awww, Patchy Cat is so hardworking. 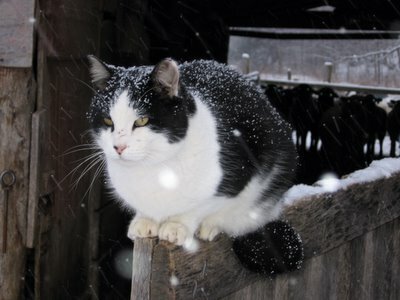 If I saw snow, I will run away as I'm a tropical kitty. Please give him a big hug for me to warm up. Patchy Cat is one tough cookie! I used to have a feral cat friend named Ozzie (well, he became less feral and more friendly over time) who used to sit in the snow and cry pitifully. I would go out with a towel and rub him down, but he didn't have enough sense to get out of the snow.